Around 75 members of a federal employee union picketed outside of the Health and Human Services Department's headquarters in Washington, D.C., on Thursday, demanding that the department’s leadership return to the bargaining table to negotiate a new collective bargaining agreement. Earlier this year, HHS officials declared an impasse in discussions with the National Treasury Employees Union in their negotiations for a new contract, sending proposals to the Federal Service Impasses Panel for arbitration. Union officials said that management sat down for one day of negotiations but refused to even answer questions about their proposal, which would have stripped a variety of provisions from the existing contract, including transit subsidies, alternative work schedules and telework. NTEU has said HHS officials then sat down for “an hour or two” of negotiations with a mediator, at which point they declared an impasse. 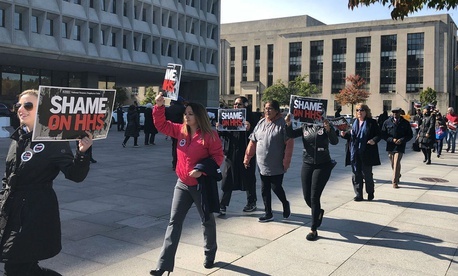 Union leaders, including members of the team that tried to negotiate a new collective bargaining agreement, said HHS’ actions constituted “bad faith bargaining,” which is prohibited by the 1978 Civil Service Reform Act. NTEU National President Tony Reardon told members that HHS’ efforts to move swiftly to the FSIP were a “sham,” intended to check the boxes of the collective bargaining process without actually negotiating with the union. NTEU accused the department of continuing to push forward with provisions of a now-enjoined series of executive orders that sought to make it easier to fire federal workers, set time limits on contract negotiations and reduce the influence of unions at federal agencies. HHS has denied those claims, arguing that its proposals were offered independently from the presidential orders. But Ty Owens, who was in the negotiating sessions, said that argument does not pass muster. Del. Eleanor Holmes Norton, D-D.C., said Trump administration officials are using the HHS-NTEU negotiations as a trial balloon to test how far they can go in eschewing traditional labor-management relations and practices.